On average approximately 20% of all power outages that occur on SWCE’s system are due to vegetation affecting the overhead power lines. SWCE has an active vegetation management program that has tree contractors clearing the area around power lines year around. To maintain proper clearance around overhead power lines, SWCE will clear approximately 10 feet on each side of the power line. If you believe you have a tree issue that will affect your electrical service you can call SWCE or fill out the Report a Tree Issue form and submit it electronically to Dan at dmeier@swce.coop. If you have a picture of the tree please submit it with the form. SWCE will make arrangement to look at your tree issue and add it to the trimming schedule if required. Please contact SWCE’s Operations Division if you find a tree issue that you believe SWCE needs to be aware of. You can either call the office or fill out and submit the Report a Tree Issue form found under Documents and Forms. If you have a picture of the tree please submit it with the form. SWCE will send a representative out to evaluate the tree concern. 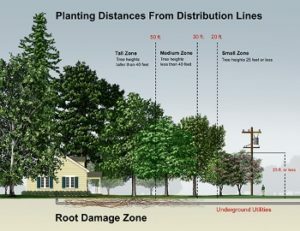 If the tree issue is outside the clearance zone around SWCE power lines, you can hire a tree contractor of your choice to address the tree issue. SWCE members can help keep the vegetation management costs down by planting the correct size trees and shrubs near overhead power lines. When planting a new tree, keep in mind the mature height of the tree. Only trees with a mature height of 25 feet or less should be planted within 20 feet of an overhead power line. Taller trees should be planted the fall distance away from the overhead power lines. For more ideas on the right tree to plant, please view The Right Tree brochure found under Documents and Forms. SWCE as required setback for shrubbery that is planted around underground transformers and junction boxes. Please keep in mind the mature width of the shrub when planting. Please do not raise the grade around the transformer as it may restrict access to the equipment. Without these clearance distances, SWCE crews may not be able to address power issues or maintain the electrical equipment. 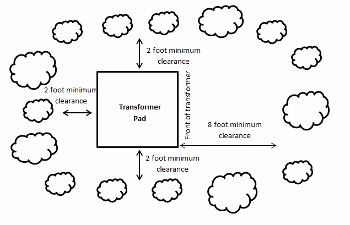 The eight foot working distance in front of the transformer door is the minimum distance required. The two foot minimum clearance for shrubbery around the sides and back of the transformer is for the mature width of the shrub. In the event of an emergency, please do not use email to contact SWCE. We cannot guarantee messages received via email will be monitored during an outage.